Backstage Press: Female Lead Singers, Anyone? A few weeks back I was approached by a rep from bigMETHOD.com, a PR firm out of Los Angeles. I was given a press release detailing Grace Potter and the Nocturnals' upcoming self-titled album, due out June 8 on Hollywood Records. The name sound familiar to you? It should. They gave the closing track on Almost Alice, that sweet movie soundtrack that dropped last week. Anyway, since then I've been checking this band out to grab a hold of their sound and see what they're all about. Turns out, they're New Englanders. Major plus in my book. Hailing from Waitsfield, Vermont, the quintet have been kicking it for some time now. In fact, their self-titled album will be their first release since '07. So, you're probably wondering what they sound like, right? Well, if you're into a soft rock sound, harkening back to the days of old, GPN are perfect for you. 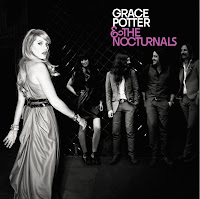 Lead singer Grace Potter has a voice reminiscent of Janis Joplin, while the rest of the Nocturnals provide an interesting mix of Led Zeppelin infused indie rock. Does that make sense? Okay, think Silversun Pickups meets Paramore... if Paramore were stripped down to only acoustics and were alive in the 70s. It might be a little hard to wrap your head around, but just check out some of their stuff. Their first single off the new album is "Tiny Light", a song that builds from its inception all the way to an intense ending solo performed by guitarist Scott Tournet. Lyrically, the song outlines the band's recent hardships - yet remains poetic enough to be easily interpreted by the listener. GPN are shooting a video for "Tiny Light" this month with director Paul Minor (Muse, Queens of The Stone Age). So, sound good to you? If you've answered yes to this question, and you're one of my New England readers, you're in luck. GPN are headed throughout the region in the coming days, playing at a bunch of really cool venues before heading down to Texas for South By Southwest. Check out the tour dates below. And be sure to keep a look out for their new self-titled record due out on June 8.